I used to love gel manicures, and thought it was the best thing ever since it didn’t chip as fast as normal nail polish and was just perfect for my 2 week summer vacations. Then I tried keeping them for 6 months and after wearing them for that continuous stretch my nails were so weak. After I removed the gel my nails wouldn't hold regular nail polish for more than a couple days so I had to quit nail polish for awhile to nurse my nails back to health, it was horrible let me tell you. lol Once they were back to normal, my nails used to break all the time and I never got any length. I very quickly got sick of how often I was thinking about them as they were always splitting and peeling. Then I heard about dip nails. What is that you ask? Well it's not a new trend, it's been around a long time but wasn't talked about much. The dip nail polish is actually a powder that is sealed in between coats of wet sealant that dries instantly without a UV light. The one thing I hated about gel nails was that LED light on my hands and worried about the exposure to my skin since not all salons offer gloves for the process. Like gel, dip nails lasts chip free for 3 weeks! I could probably even stretch it out longer if I wanted to. The removal process is easier on your nails than gel. You soak your nails in a bowl of acetone for 15 minutes and it easily dissolves. The most popular brands of dip powder are SNS and Nexgen and thus it's often called one of those names instead of just "dip". 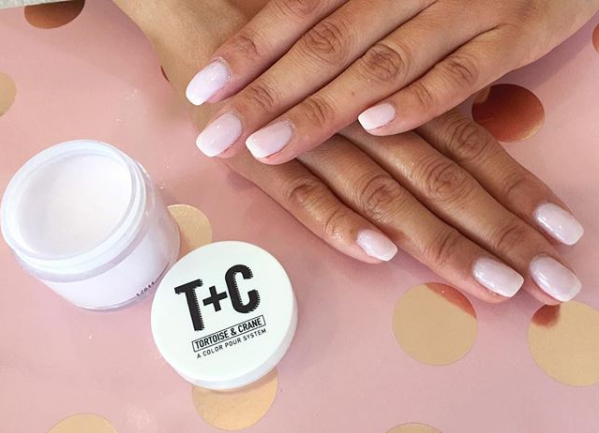 The powder has vitamin E and calcium in it to help strengthen your nails and has no smell. I pay $40 to have this done and have been really happy with the results. The nails are thin to the touch but don't quite feel like naked nails when you scratch yourself. The whole process takes about one hour to do. I've done it 3 times now and am addicted! The last time I had my polish removed, I couldn't believe how long my nails had grown! And they felt strong naked without the dip powder on them. Unlike when I'd remove gel and my nails would feel weak. The only downside of the dip nails is that the salon uses an electric file to buff my nails. Not sure if that damages them or not? The other issue is all the customers are dipping their fingers into the same jar of powder. I'm not asked to wash my hands first, but maybe having soaked my fingertips in acetone sterilizes them? I have a friend who does these at home and she recommends this starter kit to see if you like the process of doing it yourself. And she soaks off her nail polish in this bowl. I've been toying with the idea of doing it myself but don't want to commit to the start up costs of buying all the colors when I already have so many regular colors. But the idea of having dip nails without the filing done at salons by the dremel tool does appeal to me. I am now totally obsessed with dip nails! My nails never chip and I'm finally able to grow long nails, it basically makes your nails bulletproof. And there's a huge range of colors to choose from including sparkle. With dip nails you only have to deal with your nails every 3 weeks and don't have to think about them because your nails are indestructible. I have been doing dip nails for a couple months now and now my nails never break and seem to be very strong so I'm hooked! I've been researching this for a while. Thanks for the info! That's exactly why I avoided gel polish. I was blessed with super strong nails, which I've always been proud of. I did gel once and I hated how thin they got. I;m glad I have another option! Thanks for sharing! I've never heard of this, sounds very cool! Oh I'm intrigued! Your nails looks so pretty...I'm a nail biter and have got to stop!